How To Treat MRSA Naturally And Get Results! Many people in this modern age seem to have forgotten the fact that before synthetic (man-made) antibiotics were discovered and introduced to mainstream medicine, Doctor’s relied upon natural treatments for common illnesses. My intention with this article is to “re-educate” you and explain how to treat MRSA naturally and get results. 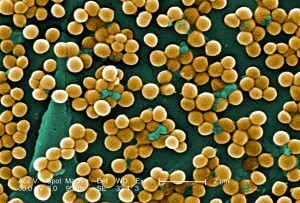 Methicillin Resistant Staphylococcus Aureus (MRSA) is the antibiotic resistant strain of the “common” bacteria known as Staphylococcus Aureus or Staph for short. Staph itself is a common bacteria found on the skin of most people. If a person is in good health, the Staph is unlikely to ever cause any problems. If a person is ill though i.e. has lowered immunity, Staph can lead to infections of cuts, scratches, grazes, and surgical wounds. Staph is also the common cause of boils. MRSA, Staph’s big bad brother, has become more and more prevalent of late and it seems to be creating headlines. It is often even referred to as a “superbug” which sounds scary right? The reality is though that MRSA is actually just regular old Staph. 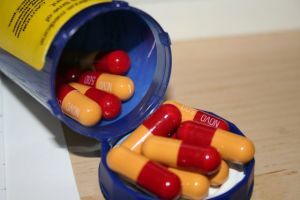 Its just that it has become harder to kill using modern antibiotics due to the fact that it has developed (and continues to develop) a resistance to them. How and why has this happened? Overuse of modern antibiotics has caused all sorts of problems including the evolution of “superbugs”. Essentially this happened because modern antibiotics were initially very successful at dealing with infection and disease. They were fast acting and they got results. As a result, natural treatments were used less and less until eventually they came to be considered “alternative” treatments and thought of as “hocus pocus”. However, because modern antibiotics are synthetic, man-made products, they have a simple molecular structure. Because of this, the bacteria and other nasties soon began to develop a resistance to these early antibiotics. As a result, stronger antibiotics had to be produced to deal with the nasties that were no longer affected by the original antibiotics. These worked for a time until the nasties once again developed a resistance. So…as you should be beginning to understand…it becomes and endless cycle where modern antibiotics have to keep getting stronger and stronger to deal with what once was dealt with my “simple”natural treatments. If the bacteria and other nasties are stronger than ever, how can natural treatments be effective? Its quite simple really…it’s because they are natural. They ARE NOT synthetic,man-made products like modern day antibiotics are that have “simple”molecular” structures. Natural treatments are still effective because they DO HAVE “complex” molecular structures which the nasties can’t develop a resistance to. This means that bacteria, even “superbugs” like MRSA are still able to be effectively treated using natural products that have antibiotic or antibacterial properties. So what natural products work? Mother Nature’s gift….a multitude of natural products that have medicinal uses. To be honest, the list is MASSIVE! Mother Nature has provided us with vast quantities of natural products that have medicinal uses. As such, I’m not going to list them all. I’m just going to list some of those that I have personally used and had success with. How do I use these products to treat a MRSA infection? 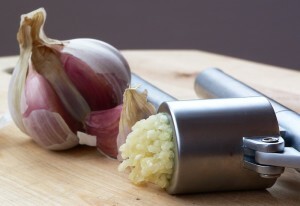 The Allicin found in Garlic is a highly effective against MRSA and other nasties! It depends on the nature of the infection really, but generally all of these products can be used topically (i.e. on the skin…not internally) and some, namely Olive Leaf Extract, Oregano Oil (in capsule form),Vitamin C, Garlic, and Probiotics can also be taken internally (i.e. ingested). So…for boils and other skin or wound infections I suggest using the essential oils to cleanse the infection site, then use either Manuka honey, Allicin (Garlic) gel or cream, or Oregano oil as a topical treatment over which you should apply a clean wound dressing. Is there anything else I should now about MRSA? Yes there is. As I mentioned earlier, MRSA (along with all other skin-borne bacteria) usually colonise certain areas of the body. 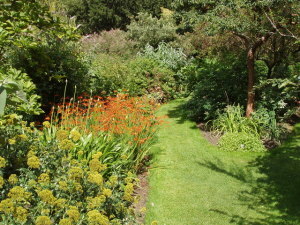 These areas are usually warm and damp and have conditions that allow the bacteria to multiply. You should attempt to “cleanse” these areas as well otherwise you risk reinfection. Because Staph lives on the skin of most people, chances are you will never get rid of the Staph bacteria entirely, but by lowering the number of bacteria on your skin by frequently cleaning out these colonised areas will reduce the likelihood of reinfection. What areas should I concern myself with then? 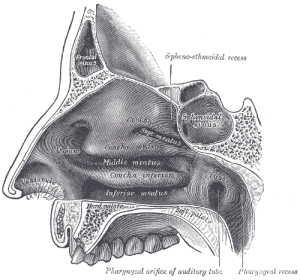 There are plenty of places for MRSA to hide out in the nasal cavity. Inhalations and creams work best to kill MRSA colonies in this area. The nose, the armpits, and the groin are the main ones. For the nose, an Allicin (Garlic) cream or gel will work, as will doing inhalations with certain essential oils in the hot water. For the other areas, a liquid or bar soap containing Tea Tree essential oil is ideal. If you are still uncertain, or would just like to know exactly how to deal with MRSA take a look at my eBook, The Boil Bible. In it I cover all of the aspects required to effectively deal with MRSA infections. It includes my personal story and how I was able to make a full recovery. It also includes effective treatments, talks about antibiotics and natural treatments in more depth, and has my personal treatment routine. Essentially, The Boil Bible covers in detail how to effectively treat MRSA and is guaranteed to help you make a full recovery. Anyway…enough of that. I hope this article has helped you? You should now have a basic understanding of how to treat MRSA naturally. Feel free to leave a comment below or click here to return to the Boil Bible homepage where you will find our latest posts. Jeremy, I must say that this website is very informative for people who are suffering from boil or MRSA. I see that you are not all about selling, you actually provide real genuine information which is what people are looking for. Your ebook cover is dynamic as well. Keep on doing what you are doing and to you success forever. Jason, thanks for your thoughtful comments. I really appreciate them. As for the site…that’s what it’s about…sharing my knowledge and experience to help others. Oh…and I’m glad you like the eBook cover design! Nice informative Website. I hope all the right people get thisinformation!